Cobham Aviation Services president Peter Nottage says the ability to serve remote mining centres with unpaved runways using jet aircraft provides its mining clients with a faster and more efficient service. The fly-in/fly-out and charter operator has five jet aircraft – three BAe 146s and two Avro RJ85s – that are dedicated to operating on unpaved airstrips, having been fitted with fitted with a gravel protection kit from BAE Systems and low pressure tyres. The five aircraft serve five unpaved runway destinations in Western Australia, opening up gravel airstrips in Australia to commercial passenger jet aircraft for the first time. Cobham Aviation Services’ unpaved runway operations included flying mine workers of Northern Star Resources on 82-seat RJ85s from Perth to Jundee in the WA’s northern goldfields region and Plutonic mine east of Meekatharra, and Gold Fields Australia sites atGranny Smith and Darlot, about 720km north-east of Perth. 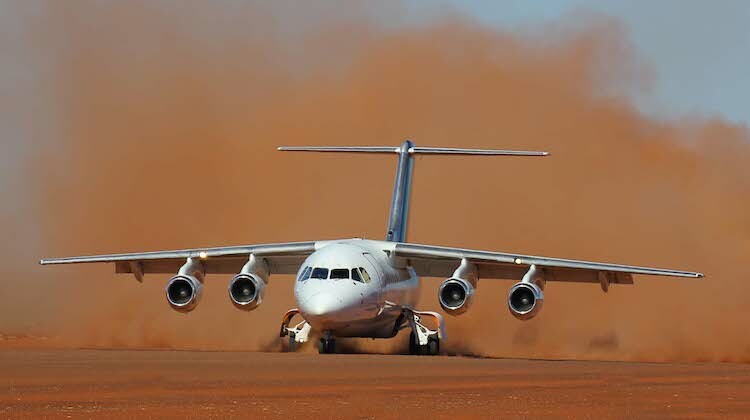 “Cobham is the only aviation service provider in Australia operating jet aircraft (BAe 146/Avro RJ) to gravel runways, opening up a new market opportunity to bid for work at remote mine sites,” BAE Systems said in a statement dated December 2. The use of jet aircraft to unpaved runways took a step forward in March when the European Aviation Safety Authority signed off on an increase in maximum takeoff weight (MTOW) for operators of the BAe 146-100/200 regional jet on unpaved runways, following the results of a two-year trial. This added about four tonnes of potential payload, which equated to about 40 more passengers, an extra 700nm of range, or a mix of the two. While the BAe 146 and Avro RJ had been previously certified for use on unpaved runways, the regulations required a reduction in maximum takeoff weight due to a “bump factor” being applied to maintain the same factored ground loads as for paved runway loads. However, the two-year trial, which involved collecting data from a Cobham BAe 146 flying between Perth and Kambalda, showed there was no significant difference in paved and unpaved runway operations, which supported the removal of the “bump factor”. “We have worked hard to ensure our customers realise the value in changing from traditional turboprop aircraft to the faster more efficient BAe 146/Avro RJ – the only regional jet aircraft capable of operating on remote gravel runways,” Cobham Aviation Services president Peter Nottage said in a statement. BAE Systems Regional Aircraft Head of Flight Operations Support Stephen Morrison said the company had worked closely with Cobham Aviation Services on its unpaved runway operations. With Cobham seeking to fly to more unpaved runway destinations, we are delighted to work alongside our customer to help them realise the full potential of the aircraft’s design capability,” Morrison said.